Bread making is one of the most satisfying tasks in the kitchen, and it's great fun. It's also highly creative - you can shape homely organic loaves or stylish rolls according to your mood, and flavour your breads to match your meal. My husband, Nick, is a keen baker, following in the steps of his grandfather, a baker in Bembridge on the Isle of Wight. What amazes me most about his bread making is his method - he measures the water, then simply adds the other ingredients until the dough feels right. It works every time, especially when using the quick-action, easy-blend dried yeast. It's only when you start adding lots of butter and eggs that weights start to become critical. You do, however, need to allow plenty of time for baking. I believe that the longer the bread-making process, the better the flavour of the final loaves. If you've always thought that making your own bread is too tricky to attempt, try our step-by-step recipe, and discover how easy it is. When entertaining, we often add chillies, roast garlic, sage, walnuts or crumbled cheese to our doughs, then shape it into rolls. For a breakfast bread, I like to add fennel and caraway seeds with orange zest - a variation on a traditional Swedish recipe - which produces a loaf that's great with butter and marmalade, or with cheese, cold meats or pickled fish. And when it's all ready to eat... well, that's real satisfaction! These flavoured breads will inspire you to create your own variations. Follow the method for our basic bread, but use a half-quantity of ingredients to make 1 large loaf, 2 small loaves or 12-15 rolls. Canadian wheat has more gluten, giving an extra lift and spring to bread. Good, general purpose bread making flour for all types of white loaves. 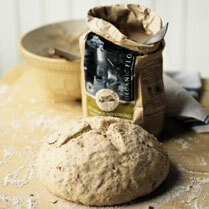 Waitrose strong wholemeal plain flour for bread making. A flour with plenty of bran, making a coarse and open-textured bread. For bread making, this is produced to international standards of organic husbandry. Available for those with a wheat allergy. Makes excellent soda bread, and heavy yeasted loaves.